The Belvedere bar unit is sure to be admired and appreciated by experienced sommeliers and casual sippers as an essential for entertaining cocktail gatherings and dinner parties. Designed to hold plenty of wine bottles, plenty of stemware, and a variety of spirits and accessories, this bar unit can neatly contain everything you need for pouring the perfect cocktail. 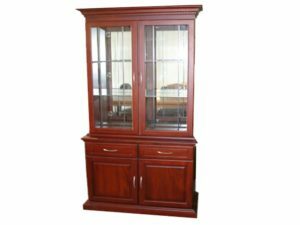 It is made from solid Mahogany timber that will last for many years growing more graceful with age.